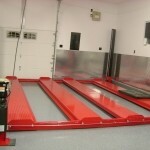 Ever dreamed of having a mezzanine that would move up and down in your garage? We’ve turned that dream into reality. 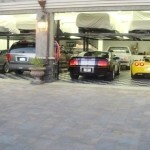 The all new Super Twin is perfect for doubling the space of your two car garage. 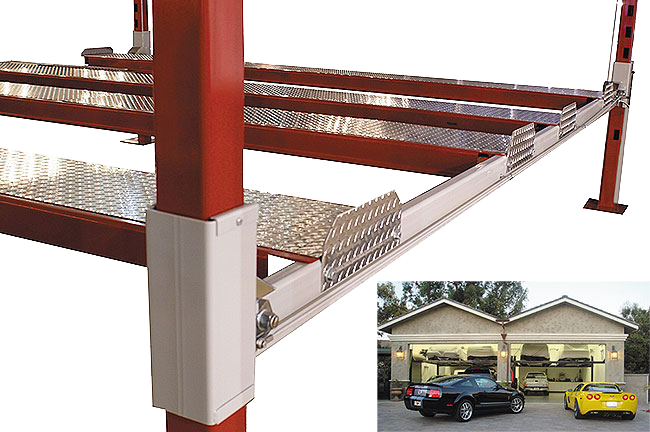 Because of the free span between the post, you (and your wife) won’t have to deal with the obstruction of a center post when driving into your garage. An optional solid deck creates what amounts to a second story in your garage for accessible storage of virtually anything. The exclusive Super Twin is engineered to hold up to 9,000 lbs — 4,500 on each side — or 6,000 lbs down the center. The cross bars are pre-arched and double re-enforced to prevent sagging. Anchoring the Super Twin to your floor is recommended but not required. The Super Twin is custom built to your garage specifications. Our expert technicians can assist you in designing the perfect Super Twin for your application. 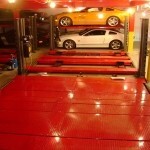 We also do turn-key installations nationwide.